These healthy Starbucks Red Pepper Egg Bites are delicious and loaded with protein! They’re the perfect on the go breakfast. Instant Pot Egg Bites can easily be made in the oven as well. If you haven’t had a chance to try the Starbucks Sous Vide egg bites you might not know what you are missing. Good news! Now you don’t have to miss out at all! You can make these healthy Starbucks red pepper egg bites at home in your Instant Pot or in the oven. This is a great meal prep idea and perfect for those busy mornings when you want something warm for breakfast but don’t have time to cook! Are these Starbucks Sous Vide egg bites? Yes and no! These are a copycat recipe of the Starbucks Sous Vide Egg Bites. The ones I’m sharing with you today are not cooked with a Sous Vide…mostly because not everyone has access to this cooking equipment. Works great as a breakfast option when combined with some whole wheat toast or an English muffin. Can be used as a snack throughout the day as well. Will count mostly as a protein so you’ll need to add some veggies to your plate as well! You’ll need to use fat free greek yogurt, 1% cottage cheese, and this is calculated to 7 servings via the Weight Watchers online recipe creator! Starbucks red pepper egg bites are Keto and low carb friendly! You’ll need to use real bacon for a truly Keto friendly version but these are a great low carb choice! For two egg bites, it is 4 net carbs. They’re packed with protein which means they’ll help you stay fuller for longer periods of time. These egg bites make a great post workout snack too. Whip up a batch of these and eat them during the week for breakfast or as a healthy snack during the day. Can I freeze these Starbucks red pepper egg bites? You can absolutely freeze these Starbucks red pepper egg bites. I’d make sure to wrap them in parchment or divide them up somehow so that they don’t freeze into a large clump but other than that they freeze so well! Are these a healthy alternative to Starbucks egg bites? Yes! One of the great things about making these copycat Starbucks red pepper egg bites at home is that you’ll get to see each and every ingredient going into the mixture…first hand! There are no labels to read and no hoping that there’s good stuff in there! You’ll know that there is plenty of healthy and wholesome ingredients in these egg bites. The traditional egg bites sold at the popular restaurant include heavy cream and cream cheese, among other ingredients. I use greek yogurt and cottage cheese in this recipe, which gives these a light and fluffy texture without all of the processed and heavy ingredients. This Starbucks Egg White Bites Recipe is delicious and wrapped in bacon! Weight Watchers Egg Bites have Freestyle SmartPoints calculated right in the post, along with what substitutions to make in the recipe for that diet. Tomato and Basil Egg Bites Recipe is the classic recipe that started it all. Dairy Free Egg Bites are made with tofu (but blended for a fluffy texture) and delicious for those of you who can’t consume dairy. I try not to keep cooked eggs hanging around in my refrigerator for more than 3-4 days. I like to make large batches of these healthy Starbucks red bell pepper egg bites and freeze them. Then I can just pop them out when I need them and be on my way. I know that they’ll stay fresh and tasty and there’s no worry that they’ll spoil. Some readers have reported good luck with keeping them in the fridge for the week but it all depends on how you feel about cooked eggs. Just know that freezing them won’t ruin the texture or the consistency. Can I make these healthy Starbucks red pepper egg bites in the Instant Pot? Be sure you don’t skip out on greasing the egg bite molds. That NEEDS to be done for them to pop out properly. 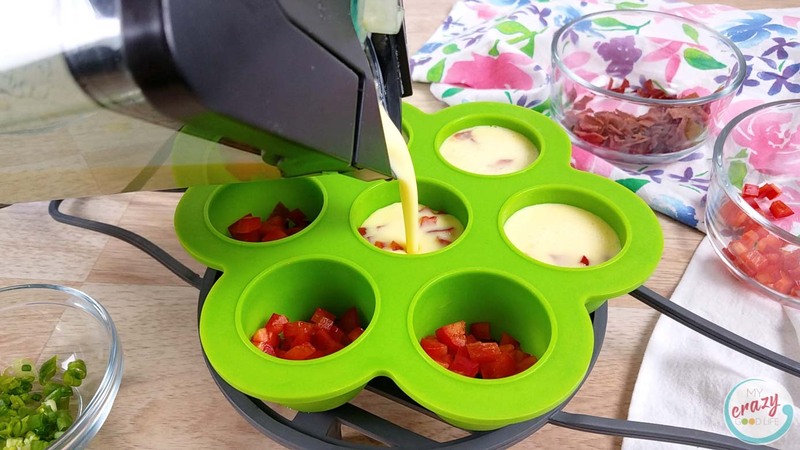 1) Grease the silicone egg bite molds with the oil so that the egg bites do not stick in the container. 2) Next, fill each cup of the silicone mold half way full of green onions, turkey bacon, and bell peppers. 3) In a blender mix together the egg, cheese, Greek yogurt, and cottage cheese. Blend for 30 seconds. 4) Pour the egg mixture in the silicone mold. Fill each cup to about 1/4 below the brim. Cover with foil. 5) Add 1 cup of water the bottom of the Instant Pot insert. Place a trivet on the bottom them stack both trays of egg bites on top of the trivet. Place the top tray slightly offset so that the cups are not directly on top of each other. 6) Close the lid and turn the pressure valve to sealing. Cook on high pressure using the “Steam” function for 8 minutes. Let the pressure naturally release. 7) Turn off the Instant Pot and remove the egg bites from the Instant Pot. 8) Take off the foil and flip the egg bites upside to cool and remove from the silicone tray. Serve warm or store in the refrigerator for up to a week. They can also be frozen for up to a month and reheated in the microwave for a minute. How about the oven? Can these egg bites be baked in the oven? 1) Pre-heat the oven to 375 degrees. 2) Grease a mini muffin pan with the oil. 3) Fill each muffin cup with the green onions, bell peppers, and turkey bacon. 4) Blend together the eggs, cheese, Greek yogurt, and cottage cheese for 30 seconds then fill the muffin cups with the egg mixture. Cover with foil. 5) Place a baking tray full of water on the bottom rack of the oven. Then place the egg bites in the oven on the top rack. 6) Cook the egg bites for 20 minutes then remove and let the egg bites cool for at least 5 minutes before removing from the pan. Be careful opening the oven, there will be lots of steam. Enjoy! Where can I get those glass meal prep containers? You can get them right here. And if you don’t have a set of egg bite molds you can get those right here. Grease the silicone egg bite molds with the oil so that the egg bites do not stick in the container. Next fill each cup of the silicone mold half way full of green onions, turkey bacon, and bell peppers. In a blender mix together the egg, cheese, Greek yogurt, and cottage cheese. Blend for 30 seconds. Pour the egg mixture in the silicone mold. Fill each cup to about 1/4 below the brim. Cover with foil. Add 1 cup of water the bottom of the Instant Pot insert. Place a trivet on the bottom them stack both trays of egg bites on top of the trivet. Place the top tray slightly offset so that the cups are not directly on top of each other. Close the lid and turn the pressure valve to sealing. Cook on high pressure using the "Steam" function for 8 minutes. Let the pressure naturally release. Turn off the Instant Pot and remove the egg bites from the Instant Pot. Take off the foil and flip the egg bites upside to cool and remove from the silicone tray. Serve warm or store in the refrigerator for up to a week. They can also be frozen for up to a month and reheated in the microwave for a minute. Grease a mini muffin pan with the oil. 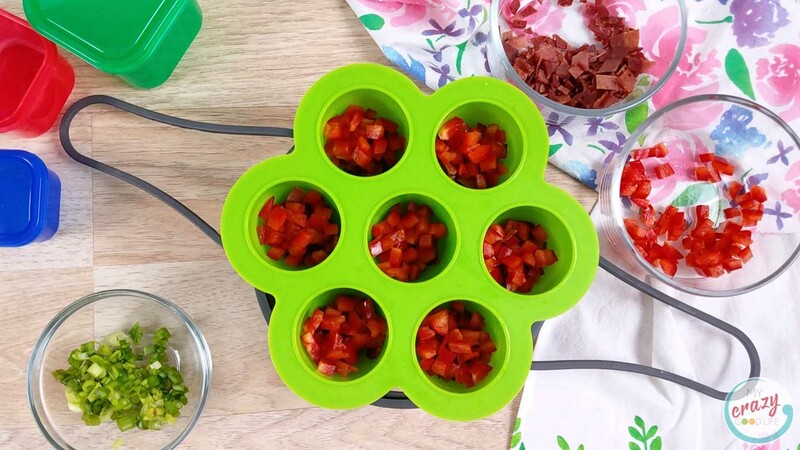 Fill each muffin cup with the green onions, bell peppers, and turkey bacon. Blend together the eggs, cheese, Greek yogurt, and cottage cheese for 30 seconds then fill the muffin cups with the egg mixture. Cover with foil. Place a baking tray full of water on the bottom rack of the oven. Then place the egg bites in the oven on the top rack. Cook the egg bites for 20 minutes then remove and let the egg bites cool for at least 5 minutes before removing from the pan. Be careful opening the oven, there will be lots of steam. Enjoy! Per serving: Just over 1R 1/4B 1/3G Negligible tsp. Works great as a breakfast option when combined with some whole wheat toast or an English muffin. Can be used as a snack throughout the day as well. Will count mostly as a protein so you'll need to add some veggies to your plate as well! 4 Freestyle Smart Points Per Serving You'll need to use fat free greek yogurt, 1% cottage cheese, and this is calculated to 7 servings via the Weight Watchers online recipe creator! I just did my first trial run of making these last week… after I found out how many carbs were in the ones from the shop. I’ll be trying these next! I need to get out more because I’ve never seen these before. I love how easy they are to make and that silicone mold is awesome. Thanks for the recipe. I can’t wait to try these! How can I store these? Should I freeze them? How long will they stay good in the fridge? You can freeze these! In the fridge, I’d keep them about 5 days. How many calories is in one egg bite? 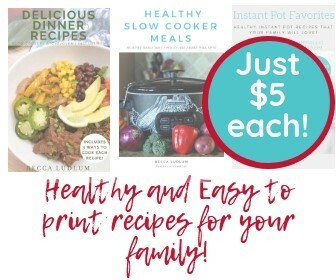 Nutrition information is right inside the printable recipe at the bottom of the post! I do not like cottage cheese, not even a little bit. Can I leave the cottege cheese out? Hi Susan, they won’t be as creamy. I don’t like cottage cheese (or greek yogurt), but I find that blending it makes it much more palatable. I’d urge you to try the cottage cheese, but if you’d rather not you should be able to just use greek yogurt! I modified this slightly, as the possibilities are endless! I used sautéed mushrooms, diced cooked chicken sausages and a pinch of Parmesan cheese. I added the recipe to WW app to get points calculated—2 points for 2 bites!! Woohoo!! Will definitely remain a staple in our house. Can these be made with just egg whites? How to you heat these from frozen in the microwave? Stacy, I pop these in the microwave for 1 1/2 to 2 minutes or so! Thanks! On full power? And how long do they stay good frozen? I do full power, but every microwave is a little different. I have had them frozen for a few months and they’ve done great! I just made the ones in the oven with mini muffin tins. I had a lot of the egg mixture leftover and I didn’t even use the turkey bacon. I think 2 cups of red pepper might be too much for this quantity. I’m not sure what went wrong with the proportions. They’re pepper heavy, but tasty.